Churchill is Prime Minister for the last time. Rationing is still in force. All music sounds like the BBC Radiophonic Workshop. People like living in 1952: it's familiar and reassuring, and Britain knows its place in the world. Few have noticed it's been 1952 for the past 65 years. Meet Professor Quanderhorn; a brilliant, maverick scientific genius who has absolutely no moral compass. With his Dangerous Giant Space Laser, High Rise Farm, Invisible Robot and Fleet of Monkey-driven Lorries, he's not afraid to push the boundaries of science to their very limit. Even when it's clearly insane to keep pushing. Despite the fact he's saved the world from several Martian invasions, the attacks of the Mole People, the Troglodyte Shape-shifters and the Beatniks from Under the Sea, plus countless other sinister phenomena which threatened to rend the very fabric of reality, the Government would like to close him down. Why? Because they're terrified of him. Of his reality-warping experiments, of the mysterious button on his desk which he's constantly threatening to press. Of the unearthly secret locked in his cellar. And yet they're even more terrified it might stop being 1952 and they'll be out of power. If you like Monty Python-esque humor or the Warlock Holmes series, you'll enjoy this one. 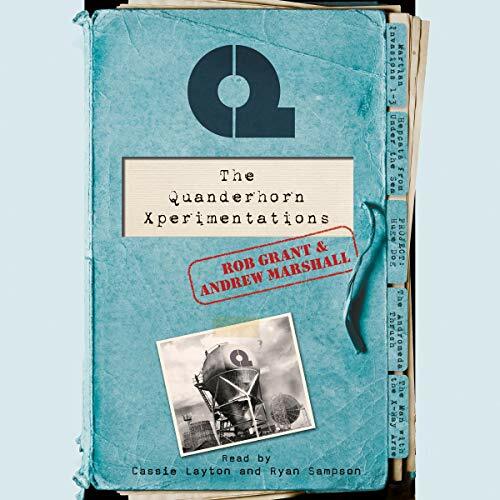 This book is an awesome parody of the Quartermass Experiments but don't worry if you're not familiar with the original. Anyone who's read or watched any SciFi will get the jokes in this book. Clever and absurd with laughs that will catch you by surprise.